When Jesus was born in Bethlehem of Judea, in the days of King Herod, behold, magi from the east arrived in Jerusalem, saying, "Where is the newborn king of the Jews? We saw his star at its rising and have come to do him homage." When King Herod heard this, he was greatly troubled, and all Jerusalem with him. Assembling all the chief priests and the scribes of the people, he inquired of them where the Christ was to be born. They said to him, "In Bethlehem of Judea, for thus it has been written through the prophet: And you, Bethlehem, land of Judah, are by no means least among the rulers of Judah, since from you shall come a ruler, who is to shepherd my people Israel." Then Herod called the magi secretly and ascertained from them the time of the star's appearance. He sent them to Bethlehem and said, "Go and search diligently for the child. When you have found him, bring me word, that I too may go and do him homage." After their audience with the king they set out. And behold, the star that they had seen at its rising preceded them, until it came and stopped over the place where the child was. They were overjoyed at seeing the star, and on entering prostrated themselves and did him homage. Then they opened their treasures and offered him gifts of god, frankincense, and myrrh. And having been warned in a dream not to return to Herod, they departed for their country by another way. 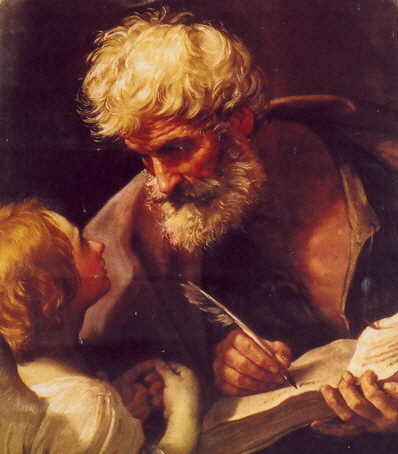 If we want to get to the very heart of today's solemnity, we have to have a better grasp of what St. Paul describes in our second reading from Ephesians when he writes: It was not made known to people in other generations as it has been now revealed to his holy apostles and prophets by the Spirit: that the Gentiles are coheirs, members of the same body, and copartners in the promise in Christ Jesus through the gospel. What St. Paul is telling his hearers is that salvation, once thought to be only for the Jews, the Chosen People of God, has now been extended to the entire human race - both Jew and Gentile alike. To be sure, living some 2,000 years after this idea was first introduced may numb us to its significance, but imagine for a moment if this were not the case. None of us, unless we were of Jewish descent would be here and the Church as we know it probably wouldn't exist and world history would have been entirely changed. This solemnity, the Epiphany, finds its roots in a word that means "manifestation." The Christ child now is manifested to not only Jewish shepherds, but to Gentile wise men, or Magi. There are several key details in the Gospel passage today that we ought not overlook for they point us to some of the deeper realities about the events surrounding our Lord's life and what these events should mean for us. 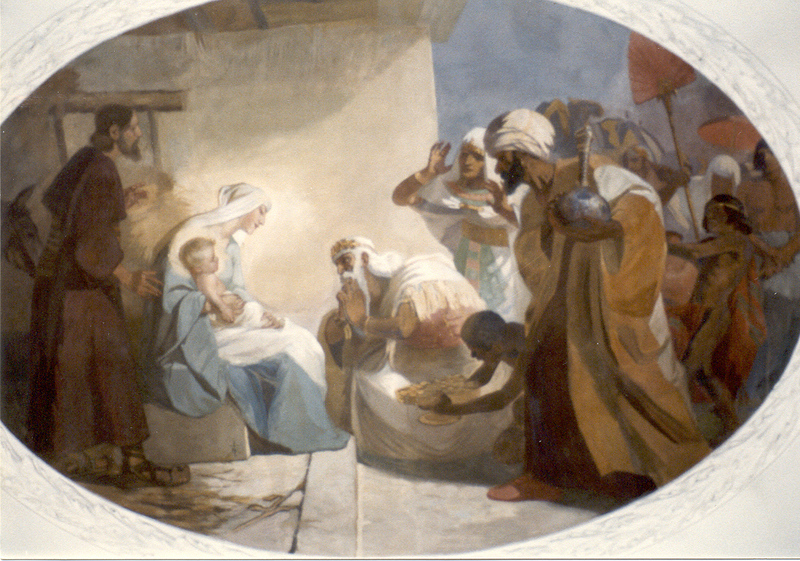 Consider for a moment that when the Magi appear, our Lord is no longer an infant - He is now described as being a child. Due to the sequence of feasts and solemnities of the liturgical calendar, we can be misled to think that the events of our Lord's early life occurred one night after another. For example, we celebrate the death of the Holy Innocents on December 28 and yet that event took place after the Epiphany, which we don't celebrate until about January 6 every year. So, these events did not take place in 12 consecutive days, but over the period of several years. We also know that our Lord was not a child because Herod sends his officers to murder all males age 2 and under. So, our Lord was at least a year old by the time all of these events take place. We also take stock of the gifts of the wise men. Gold signifies our Lord's kingship. Frankincense denotes his divinity. It was customary for an adorer to burn incense to a statue of a pagan god in ancient Rome. That's why so many Christians were killed - they refused to burn incense to an idol. Finally, myrrh which is a gum resin used for preparing a body for burial signifies our Lord's human mortality - that our Lord would die in His humanity later on His time here. Then we consider the Magi themselves. They probably weren't kings, but wise men trained in the science of the stars. They probably were monied, since they had time to study the stars and didn't have to concern themselves with the affairs of earning a daily wage. The Magi risk their personal reputations and financial comfort and stability to embark upon their journey, not really knowing what lay ahead to whether or not they would ever be successful. That's true determination and total detachment from human respect. The Magi also reveal to us the complimentarity of faith and reason. They remind us that objects of faith are more certain than objects of reason. That is why we can say that the articles of the Creed are more certain than the proposition that 2+2=4. Why? Consider the source. God is the source and object of revelation, which the articles of faith express. Meanwhile, math equations are only propositions of the human mind, a far less reliable source of information and truth. The empiricist philosophy tells us to believe that x can only be true if it can be proven. The classical Catholic position says the opposite. It says, "If God is the source then it MUST be true and in fact more certain than anything the human mind can fathom on its own because God can neither deceive nor be deceived." Unfortunately, most persons in the West are taught to think, "If I can't prove it, it's probably not true," or in moral terms, "If I don't understand or agree with the Church's teaching, the teaching is probably flawed and thereby does not bind me to obey." St. Anselm contradicted this line of thought by asserting, "I believe so that I may understand." Keep in mind that for Catholics, it's not faith OR reason. Rather, it's faith AND reason. We see faith and reason as two wings of the same bird lifting us up to ponder and discover the holy face of God. As much as we esteem the Magi and rightfully so, we may overlook a small flaw in their character development. While it is faith that draws them to seek Jesus, they end up looking for him in the wrong place. They're looking for a king. So, where do they go? Jerusalem, where they expect to find a king. It's as if they suspend faith for a moment to go and seek Christ where only reason would have them go. If you know the geography of the Holy Land, Bethlehem and Jerusalem are not that close to each other - about 7 to 10 miles apart. It's almost as if the wise men were following the star, saw it in the Holy Land and then figured that the king should be in a king's palace. So, they go where they'd expect to find a king. Perhaps figuring that Bethlehem and Jerusalem are quite close to each other, the wise men probably thought that the king would be found in Jerusalem. As we know, they were wrong. For ourselves, isn't it often the fact that Christ manifests Himself in places where we don't expect Him to show up or in circumstances, illnesses, sufferings that we endure, that can at time seem devoid of God? Yet, that's exactly where He wants to meet us because doing so is an invitation to deeper faith. Like the wise men, we often look for God where we'd expect to find Him. Yet, we often discover that He is found in places and in situations that we'd least expect to find him. Therein lies a very valuable lesson that the Magi teach us. As we continue along with our celebration of this solemnity, let us have hearts filled with gratitude that our Lord wishes that all might be saved. May we have hearts full of courage to pursue Jesus like the wise men, even when that may mean difficulty. May our hearts always appreciate the relationship between faith and reason and use both gifts to better understand our God as He is, not who we want to make Him out to be so as to satisfy our curiosity or sense of security. In our daily lives, may we not find ourselves trying to form Jesus into our preconceived notions about who He is or who He should be. May our desire to discover Jesus lead to the same type of joy that the wise men experienced when they came upon the Holy Family in Bethlehem, so many years ago.